It’s been a tough day on the road and you’ve just sat down to a well-deserved lunch. You’ve ordered your meal, and the first sip of closer’s coffee hits your throat when your phone rings. It’s the boss and he’s raging. You were supposed to be at the office 10 minutes ago to meet with Mr. John Smith, a notoriously difficult client, but you completely forgot about it. Unless you’re there in five minutes, the deal is off. There goes your commission and two years of hard work. If only you had a personal assistant to keep an eye on your diary and warn you about upcoming meetings. Now you do. Well, sort of. We realize that you can’t afford to miss a single thing, or let any meetings or tasks fall through the cracks, which is why you can now receive notifications from Pipedrive about important activities in real-time, so you never miss a key event, no matter where you are. And whether it’s an all-day, repeat or one-off event, you can ensure that you are notified before they start, no matter where you are. But don’t worry, this doesn’t replace any of our current notifications, whether by e-mail or in the app itself. Think of this as an early warning system, with the loud alarms and flashing lights still to come. Android users also have the option of seeing more information right on the notification by simply sliding their finger on the screen, or even marking the activity as done right there and then. 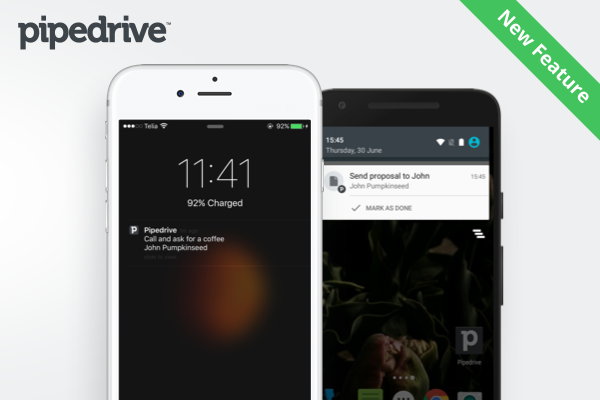 Make sure you have the latest version of the Pipedrive app installed. If your device is configured to automatically install updates, you should already have this feature. If you’ve chosen manual updates well, you know what to do. Go to the app, check for updates and install. Here are the links for Android and IOS. Learn how to find more of the right leads faster. This 22 page ebook will help you build a scalable lead qualification process for your team. By subscribing you'll get more of our best how-to guides, templates and tools via email. You can unsubscribe at anytime.